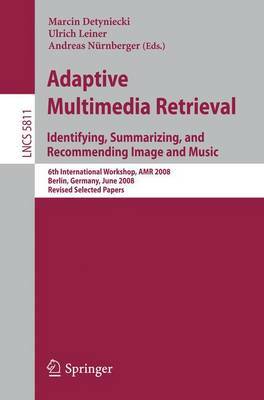 This bookis aselectionoftherevisedcontributionsthatwereinitially submitted to the International Workshop on Adaptive Multimedia Retrieval (AMR 2008). TheworkshopwasorganizedattheFraunhoferInstitute forTelecommunications HHI, Berlin, Germany, during June 26-27, 2008. The goalof the AMR workshopsis to intensify the exchangeof ideasbetween di?erentresearchcommunities,toprovideanoverviewofcurrentactivitiesinthis areaandtopointoutconnectionsbetweenthediverseresearchescommunities,in particular the ones focussing on multimedia retrieval and arti?cial intelligence. In this spirit, the ?rst three events were collocated with Arti?cial Intelligence conferences: in 2003 as a workshop of the 26th German Conference on Arti?cial Intelligence (KI 2003); in 2004 as part of the 16th European Conference on Arti?cial Intelligence (ECAI 2004) and in 2005 as part of the 19th International Joint Conference on Arti?cial Intelligence (IJCAI 05). Because of its success, in 2006 the University of Geneva, Switzerland organized the workshop for the ?rst time as a standalone event. The motivation of the participants led us to continue this path, and thus AMR 2007 and AMR 2008 were again organizedas independent events at the Laboratoired'Informatique de ParisVI in France and at the Fraunhofer Institute for Telecommunications, Heinrich Hertz Institute (HHI) in Berlin, respectively. The workshop in 2008 revealed four main subtopics: summarization, ident- cation and recommendation. These challenges addressed image, Web and music data,thelatterbeingastrongandnewpushintheAMRseries.Therefore,inthis edition, adaptive retrieval-the core subject-was tackled from quite di?erent and innovative perspectives.